My intention for this week’s recipe was to make something for St. Patrick’s Day, not a banana muffin recipe. Irish Soda Bread, Cabbage Rolls, Grasshopper smoothie, or even the traditional Corn Beef and cabbage main course. However, that all changed when ‘life’ happened. We were extra busy this weekend with the hint of spring weather that appeared. We had to take advantage of every hour of the temperatures that reached near 70 degrees to get the farm ‘caught up’ in terms of spring cleaning, set up and preparation for the building of the new chicken coop. Needless to say, that meant that we spent little time at home and our fresh fruit sitting on the counter was quite neglected. So as I set out this week to prepare my Friday recipe, all I could see was those over-ripened bananas staring pathetically at me. For those who know me, I have a difficult time throwing anything still of value out. Just because those bananas had some blemishes on the outside (don’t we all), doesn’t mean I couldn’t find a good use for them. I put aside the idea of the St. Patrick’s day dishes, and I began the baking process. Of course, I had to tweak my traditional banana bread recipe to make it without white or brown sugar and without white flour. Below is the recipe that I used to make banana muffins with more natural ingredients than those typical recipes that you find in most cookbooks. This combination of ingredients allows for substitutions that produces a moist and delicious muffin that can be eaten as an ‘on the go’ breakfast, or as a healthy alternative to that late night dessert craving. 1. Mash bananas in a large mixing bowl until lumps disappear. Add eggs, one at a time. Mix well. Add honey and mix until combined. 2. 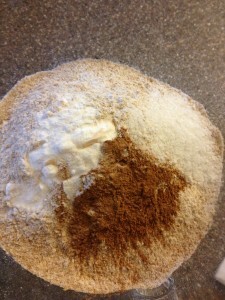 In a separate bowl, combine flour, oatmeal, salt, baking soda, and cinnamon. **Hint – I place the oatmeal in my food processor and pulse it to make it more like a powder consistency before I add it to the mixture. 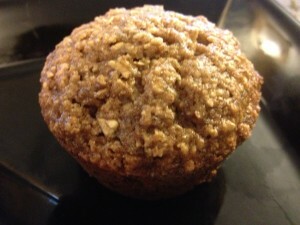 This produces a muffin that is less like an oatmeal muffin, and more like a moist banana muffin. 3. On low speed, add dry mixture a little at a time to the banana mixture. Once incorporated, add vanilla and mix just until combined. **Hint – When using wheat flour, it is important to not over-mix your batter. 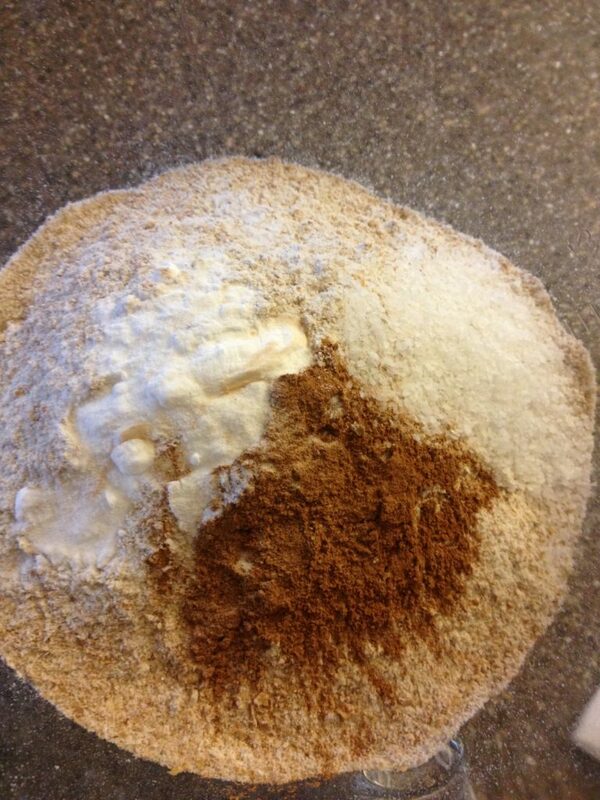 Over mixing results in dense, thick dough. 4. Place in a lined muffin tin – fill each muffin cup 2/3rd’s full. 5. Bake at 325 degrees F for approximately 20-25 minutes. 6. Cool for a few minutes, then remove to finish cooling on a cooling/baker’s rack. Mash bananas in a large mixing bowl until lumps disappear. Add eggs, one at a time. Mix well. Add honey and mix until combined. 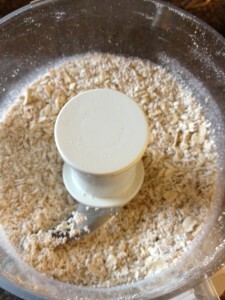 In a separate bowl, combine flour, oatmeal, salt, baking soda, and cinnamon. **Hint – I place the oatmeal in my food processor and pulse it to make it more like a powder consistency before I add it to the mixture. 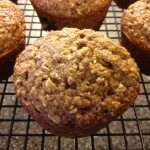 This produces a muffin that is less like an oatmeal muffin, and more like a moist banana muffin. On low speed, add dry mixture a little at a time to the banana mixture. Once incorporated, add vanilla and mix just until combined. **Hint – When using wheat flour, it is important to not over-mix your batter. Over mixing results in dense, thick dough. 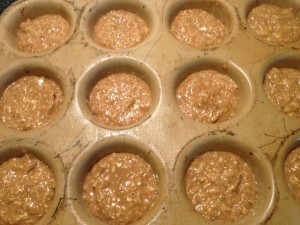 Place in a lined muffin tin – fill each muffin cup 2/3rd’s full. Bake at 325 degrees F for approximately 20-25 minutes. Cool for a few minutes, then remove to finish cooling on a cooling/baker’s rack.